Petr of Chelčice was a pacifist thinker from Bohemia who was fervently opposed to war and military action in the name of religion. 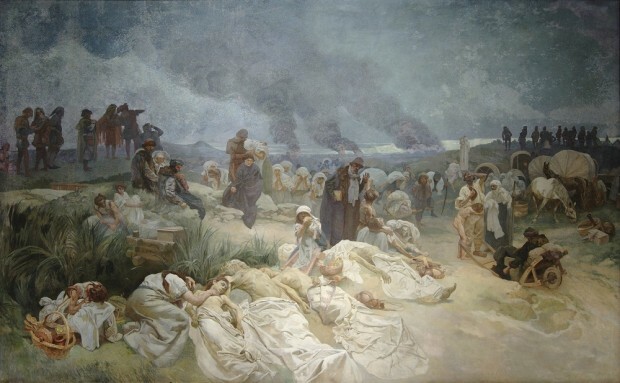 Mucha subscribed to much of Chelčice’s thinking and chose to depict the more sinister side of the Hussite Wars in this canvas, concentrating on their effect on the lives of innocent victims. The village of Vodňany fell victim to repeated Hussite attacks and the inhabitants were forced to flee their homes, taking the bodies of the injured and dead to the nearby town of Chelčice. Consumed by grief and anger against the Hussites, they gather around the bodies of the victims and the few possessions that they have managed to bring with them. Petr Chelčicky, who stands at the centre of the composition with a Bible under his right arm, offers comfort to the victims and implores them not to give in to vengeance.